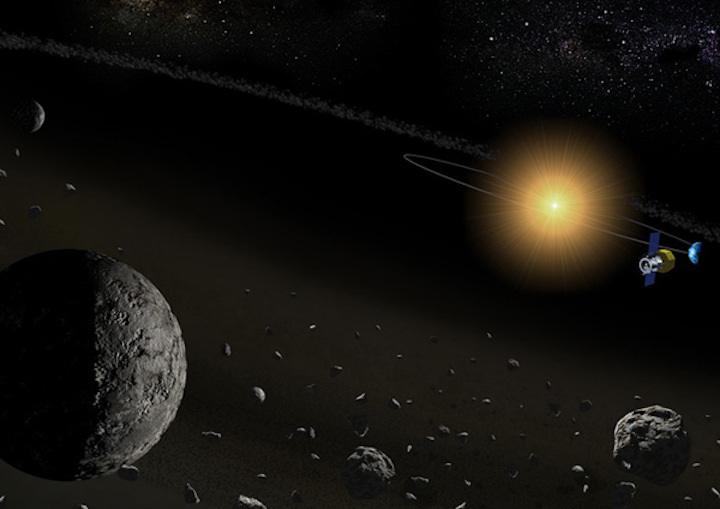 Figure 1: An artist's illustration of the near-infrared spectroscopic observation of asteroids with the infrared satellite AKARI. By using a space-borne telescope, the team was able to successfully detect the presence of water in many asteroids. Using the infrared satellite AKARI, a Japanese research team has detected the existence of water in the form of hydrated minerals in a number of asteroids for the first time. This discovery will contribute to our understanding of the distribution of water in our solar system, the evolution of asteroids, and the origin of water on Earth. The findings were made by the team led by the Project Assistant Professor Fumihiko Usui (Graduate School of Science, Kobe University), the Associate Senior Researcher Sunao Hasegawa, the Aerospace Project Research Associate Takafumi Ootsubo (Institute of Space and Astronautical Science, Japan Aerospace Exploration Agency), and Professor Emeritus Takashi Onaka (Graduate School of Science, University of Tokyo). The results were published on December 17 in the online Advanced Access edition of Publications of the Astronomical Society of Japan. The Japanese infrared satellite AKARI, launched in February 2006, was equipped with the Infrared Camera (IRC) that allowed us to obtain spectra at near-infrared wavelengths from 2 to 5 micrometers. Using this unique function, the spectroscopic observations of 66 asteroids (figure 1) were carried out and their near-infrared spectra were obtained. This provides the first opportunity to study the features of hydrated minerals in asteroids at around the wavelength of 2.7 micrometers. The observations detected absorption, which were attributed to hydrated minerals for 17 C-type asteroids (figure 2). C-type asteroids, which appear dark at visible wavelengths, were believed to be rich in water and organic material, but the present observations with AKARI are the first to directly confirm the presence of hydrated minerals in these asteroids. 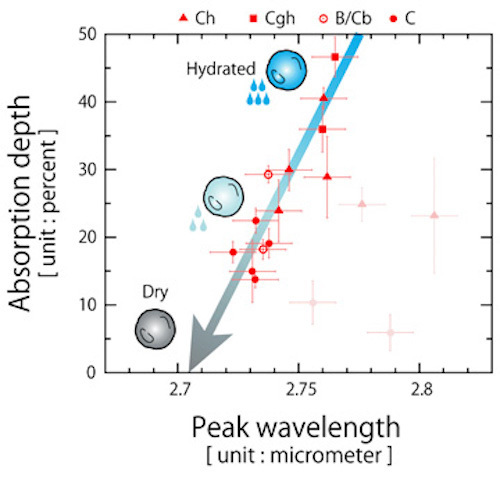 The absorption strength detected at around 2.7 micrometers varies for each asteroid, and some show absorption features of other substances, such as water ice and ammonia-rich material at around 3.1 micrometers. When examining C-type asteroids in more detail, the research team discovered a clear relationship between the wavelength of the deepest absorption and the depth of the absorption for the 2.7 micrometers feature (figure 3). This shows a trend seen in the process where hydrated minerals are being heated up and gradually losing water. The heating energy could be supplied by the solar wind plasma, micrometeorite impacts, or the decay heat from radioactive isotopes in the rocks. This trend had been predicted by meteorite measurements, but this is the first time that it has been confirmed in asteroids. Many C-type asteroids display this trend, suggesting that C-type asteroids were formed by the agglomeration of rocks and water ice, then aqueous alteration occurred in the interior of asteroids to form hydrated minerals, and finally C-type asteroids were heated and dehydrated. This study has confirmed the presence of water in asteroids. Spectra of the observed asteroids show common patterns. The size and the distance from the sun of the asteroid can be considered as important factors making differences of the spectra. To fully understand the observed patterns, it is necessary to accumulate observations of more asteroids as well as to compare with the measurement of meteorites collected on Earth. Dr. Usui comments: “By solving this puzzle, we can make a significant step towards identifying the source of Earth's water and unveiling the secret of how life began on Earth”. Figure 2: Near-infrared spectra of asteroids obtained from the AKARI observations. This shows 6 examples for both C-type and S-type asteroids. You can clearly see the absorption at wavelengths of around 2.7 micrometers (indicated by the green arrows) attributed to hydrated minerals. You can also see signatures of water ice or ammonia-rich material at around 3.1 micrometers (indicated by the blue arrows). The data shown in this figure are the reflected spectra of the sunlight by the surface of asteroids. Figure 3: The relationship between the depth of absorption and the peak wavelength of the deepest absorption for the feature at around 2.7 micrometers in C-type asteroids (shown by the green arrows in figure 2). The different marks show differences of subgroups in the types of C-type asteroids (based on the Bus-DeMeo taxonomic classification). The trend of 13 asteroids from top right to bottom left indicated by the arrow can be understood in terms of the dehydration process. Four asteroids with the thin red symbols deviate from the general trend. A further follow-up investigation is required for understanding the nature of these outliers.